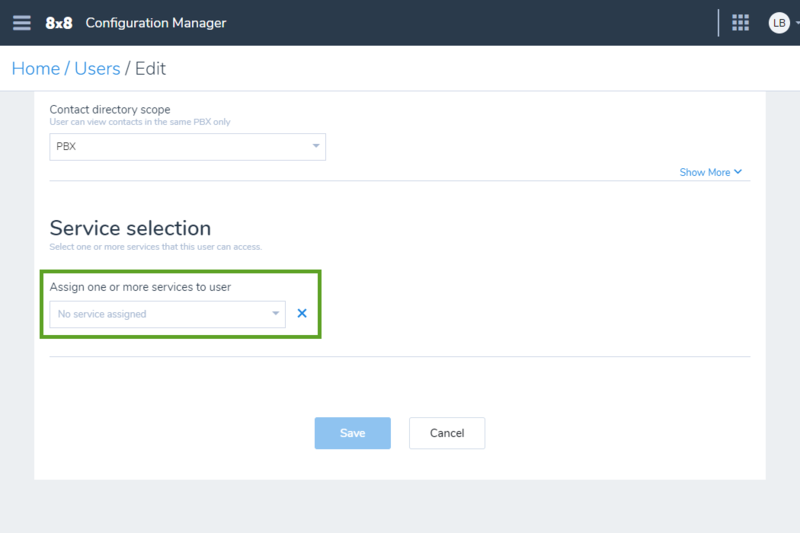 Once you have configured user provisioning settings, you can assign Okta users to the integration to synchronize them with 8x8 Configuration Manager, and grant them access to 8x8 licenses and services. 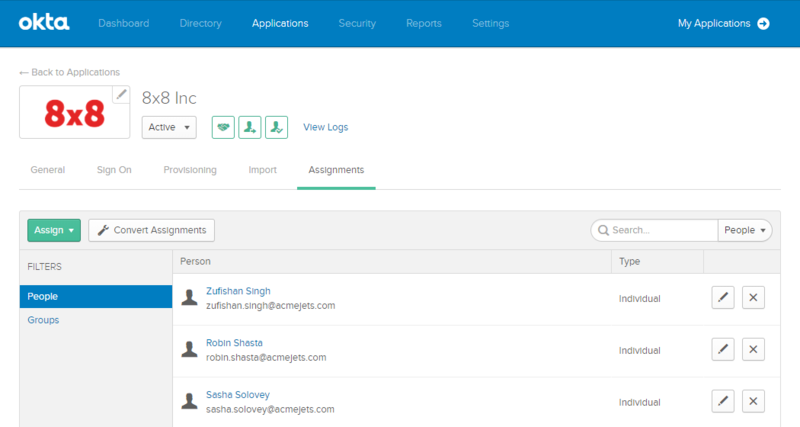 Under Applications in Okta, open your 8x8 integration app details, and then go to Assignments. Click the Assign drop-down, and select Assign to People to open a search window. Note: If you are assigning the app to all members of an existing Okta group, you can instead select Assign to Groups to assign the integration in bulk, and search by group name instead of user name. In the search window that pops up, enter the name of a user you need to assign to the integration, and click Assign next to their name in the search results. Repeat for all users as needed. When you are finished, save your changes. The users you assigned to the 8x8 integration now show up in the Assignments tab of the app details. In addition, these users are now also visible in 8x8 Configuration Manager. Log in to Configuration Manager, and go to Home > Users to see users brought in from Okta via 8x8 integration. Next to the desired user, click the More Options icon to open a drop-down menu. From the drop-down, select Edit to access user details and settings. In the user details page, scroll down to Service selection. From the drop-down list under Service selection, select the 8x8 license required for the user. Depending on the license selected, additional sections and fields appear in the user settings. Repeat steps 6-9 for all users, with the appropriate license assigned to each user. You are now ready to manage users in Okta and verify Single Sign-On behavior.